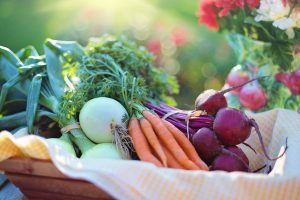 Sensory Diet – like vegetables for the brain! Children with SPD need what is known as a “sensory diet”. A sensory diet is a daily plan for them to consume multiple forms of sensory input throughout the day. A variety of different input types and consistency helps your child’s brain regulate and function. You’ll need to incorporate sensory input throughout the school day. 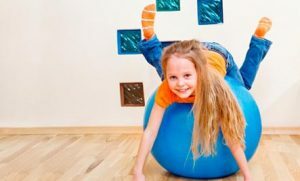 Here are some suggestions on how to give your child the sensory input they need in order to have a productive and fun time learning. Before you start your school day, have your child eat a good breakfast and go out to play. If you have a neighborhood playground where they can climb, swing and run, that is ideal. Your child’s sensory system has been set to idle all night while they slept. To get it back into the right gear, they need to move. 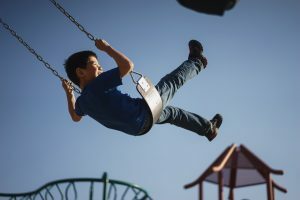 Swinging front to back is highly regulating to the brain, as is the use of big muscle groups for things like crossing monkey bars. Even though your child’s brain needs this kind of work, you may need to encourage them to play in a variety of ways. Pulling out a stopwatch and timing how fast they can climb the jungle gym or seeing who can swing higher can help engage kids who are less interested. Using chalk to make hopscotch fun or riding bikes can also be good ways to engage the sensory system. Different children need different amounts of play to get ready to learn. The brain and body need time to get in sync, and the amount of play time your child needs may be different from day to day. I recommend planning on a time between 15 minutes and an hour. However, if you are able to follow your child’s lead, wait for them to play until they come and talk to you. Once the body and brain have made their connection, your sign will be that your child will have slowed down to study a bug or to ask you about what else they get to do today. Making the most of indoor play. If you don’t have space to play outside, or the weather is uncooperative, you can still help your child get some good sensory play inside. 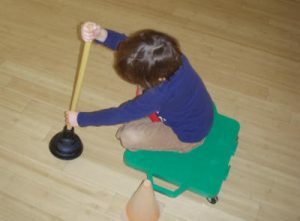 If you have hard floors, your child can use a scooter board to propel themselves across the floor with their hands. This game can be made more interesting by adding something the child must hunt for, clean up or put together. I scatter bug toys from a game around the room and tell the child they are an exterminator who has to catch all the bugs. You can also use an indoor trampoline. Counting or singing songs while jumping can add interest. Teach your child to bear walk or crab crawl. See how fast they can go down a hall and back. A small 1-2 pound medicine ball can make playing catch more interesting and engage more muscles, too. A favorite activity at my house is turning on some music and having a little dance party. My kids love that that is a game I am willing to play with them. 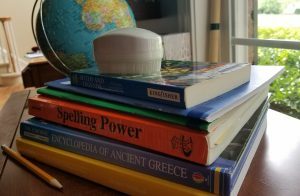 Once your child has played enough to get their brain and body working together, you can start your homeschool routine. Younger children often do best with short lessons that alternate what part of the brain is engaged. I like to have a quiet activity as a follow up to our movement activity. So, we often start with me reading a book or lesson out loud. I can count on my kids to sit and listen for at least a little while now that their bodies have had a chance to move. Next, there is something the child gets to do. Writing, coloring, or drawing. They might do a work book page, copy work, or write spelling words. We should be able to do a couple of subjects if the assignments are short. We might do a lot in just one subject if we are doing a lesson with multiple parts. After an hour, often less, I can see my child is starting to need to move around again. We take a break to do something else. This is a good time of day to add a few chores. 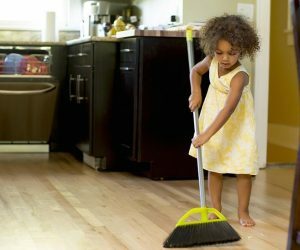 Having your child carry out the trash, put away dishes, carry laundry upstairs or other chores that engage their body is a good part of a sensory diet. My kids often do chores while I cook lunch. While the kids are eating can be another good time to read out loud to them or engage in a discussion about topics in history, literature, poetry, or science that you are studying. After lunch try an active lesson such as making art, doing a science project or building something for history. Children with SPD often learn best through hands-on projects. Build a castle from blocks, create a map from clay or other projects that engage the child’s hands along with their mind. At this point, it is usually time for another recess. Free play time is important for children’s development and allows their brains to process all that they have done that day. If you have an additional lesson to complete for the day, crunchy snacks can help a child stay alert and focused through additional work. The muscles of the mouth are just as capable of being engaged in heavy work as those of the arms or legs. Incorporating therapy homework into your day. If your child has seen an occupational therapist for their SPD, you have likely been assigned a sensory brushing protocol or other therapy homework. It is important to do this work as assigned by your therapist. I recommend pairing the brushing with other things you do each day so that it can become a natural part of your routine. Some families find that keeping the brush in a basket beside their school work allows them to brush just before working, which results in better focus. Other families place the brush in the kitchen and do brushing just after meals since they know that part of their day happens without fail. Please remember NOT to brush the stomach, as that can make the child feel ill, and no one wants to see lunch twice. Families often get overwhelmed with an intense brushing schedule, but by pairing it with meals or other parts of your routine, it can fit into your day easily. Find the schedule that works for you. My suggested schedule above will not work for every child or family. Some children need far more play breaks. Some families need to figure out a schedule that sends one child to play while another receives instructions. Make your school day work for you! However, if you can keep up a pattern of sensory activities throughout your days, this will help your child focus and retain more at each lesson. Candy in a Sensory Diet. I recommend that you limit screen time for children with SPD. It isn’t that screens are naturally evil, just that they don’t provide the right kind of sensory stimulation for your child’s body. The auditory and visual input your child receives from an iPad or TV is like candy for the sensory diet. They feel good but they lack the engagement of muscles and nerves throughout the body that your child really needs to have every day. Just like you wouldn’t want your child to eat too much candy, you need to help them do other activities than use screens. Did you ever hear of being a “sneaky chef”? It was very popular when my oldest was a toddler. We did things like adding pureed spinach and blueberries to brownies to make them more healthy. You can also do that with your child’s sensory diet. If they must spend time in front of a screen, engage them physically by having them sit on a yoga ball while using it. Sitting on a ball forces you to constantly balance and engages the muscles of the back, stomach, and legs. You can insist they use the screen while laying on their stomach and propped up on elbows. This posture develops muscles in the back and stomach and gives children more sensory input from the floor than a soft chair. Your child could also squeeze putty or pass a weighted ball from hand to hand. Anything that engages the muscles so that the body is not just passively watching the screen will help make this activity healthier for them. Remember that therapists use the word “sensory diet” because we want your child to take in good sensory “food” every day. Diet, in this sense of the word, isn’t about deprivation or limitations. It is about recognizing what is necessary to be healthy. Make time for good sensory activities the same way you make time to eat healthy meals. Your child will be happier and your homeschool journey will be easier. Previous: Previous post: Magic Monday: Bears and Leaves!